If you use this series, then please support the site. This lesson is formatted to cover two one-hour class sessions and is accompanied with two crafts: "Leaf Block Prints" and "Finger Print Trees," and two Bible games: "Fruitful Tree" and "Righteous Vs. Wicked." Session 1: Sing songs*. Present the lesson and memory verse. Make the craft. * Some modern Praise-Psalms to sing with this lesson are, "Create In Me A Clean Heart", "I Will Sing Of the Mercies of the LORD", and "The LORD Is My Shepherd". Object Lesson: God makes you grow to become righteous. (Begin the lesson by playing a quick game of guess the opposite.) What's the opposite of: happy?, up?, left?, sweet?, over?, good? Psalm 1 speaks about two opposites: Wicked people and righteous people. What do you think it means to be wicked? (Someone who has not been forgiven of their sins, and who lives a life apart from God.) What does it mean to be righteous? (Emphasize "right" when you say the word) It's a big word, but listen to the first part of the word for a clue. (To be righteous means you are "right," or perfect. To become righteous, a person must believe that Jesus died for them, taking on the punishment he or she deserved for sinning, and believe that Jesus was raised from the dead to give eternal life to all who believe and follow him. As you follow Jesus, he will then begin to make you more and more like him in the things you say, think, and do. As you hear Psalm 1 read, listen how the wicked and the righteous are described. Enrichment Idea: As you read the following Bible verses, have the children hold their thumbs up when they hear anything about God, righteous people, or good things, and have the children point their thumbs down when they hear anything about wicked or sinful people. "Blessed is the man who does not walk in the counsel of the wicked or stand in the way of sinners or sit in the seat of mockers. But his delight is in the law of the LORD, and on his law he meditates day and night. He is like a tree planted by streams of water, which yields its fruit in season and whose leaf does not wither. Whatever he does prospers. If you're not sure if you've been made "righteous" by God, you can ask him right now to forgive you, and cleanse you. Suggested Prayer: Dear Jesus, thank you for dying in my place. Thank you for taking the punishment that I deserve for sinning. Thank you for making me right with God. Help me to follow you all my days. Help me to tell others about your love and forgiveness. Amen. Optional: Give each child a small pack of tree seeds to take home as a reminder that God makes us grow to become righteous. Write "Psalm 1" on the outside of the package. This site is financially and prayerfully supported by visitors like yourself. Please help Support this Ministry service. When you are God's child, he makes you grow strong like a fruit-bearing tree whose leaf doesn't wither. To make the printing block you will need 2-3mm thick craft foam sheets with adhesive backing. Give each crafter a third to a half of a sheet. (Sparkle foam works great), scissors, acrylic paint diluted with a little water, small foam roller or paint brush, 6" square of corrugated cardboard per crafter. Cut the craft foam into various sizes and shapes of leaves. (Cut them freeform, or draw them onto the back of the foam sheet by tracing around real leaves.) Cut four 1/4" - 1/2" strips of foam to make a frame for your block. Place the foam frame strips around the edges of the cardboard. Arrange the leaf shapes onto the center area of the cardboard. Once you're pleased with your arrangement, remove the backing and permanently apply the shapes. Using the roller or paint brush, apply a thin coat of paint to the foam shapes. Avoid getting paint onto the cardboard. To print: press the block onto various surfaces such as rice paper, canvas, wood, clay tiles, etc. Repeat the pattern at least twice for added impact. This printing method may be used to decorate t-shirts, canvas bags, placemats, rugs, banners, walls, etc. Write, "Psalm 1:3" along the edge of your print. Sign your artwork. 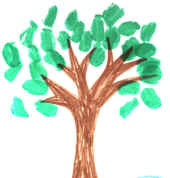 Using washable brown and green markers, draw a tree trunk with the brown marker. (Younger children may need help drawing the trunk.) Apply the green marker to one of your fingertips then press it onto the tree branches to make the leaves. Write Psalm 1:3 on the print and sign your name. Bible point: Everyone has a unique fingerprint. This Finger Print Tree will help to remind you that as you grow big and strong in God, he can use you in a unique way to share his love. Designate a large playing area using ropes, cones, or flags. Have three players stand in a huddle at the center of the playing area with their eyes closed. Have the other players line up along the outer edges of the playing area. Tell the huddled players they represent the branches on a Fruitful Tree, planted by a fresh stream of clean, clear water. At the go, the players at the outer edges must run to the Fruitful Tree to tag one or more of the huddled players. Whereupon the tagged player, or players, must shout, "Blessed are the righteous! ", open their eyes, and run to tag the other players before they are able to reach the outer edge of the playing area. The players which are tagged become part of the Fruitful Tree in the next round of play. Play continues like this until all the players are part of the Fruitful Tree. Play as long as time allows. Today's lesson on Psalm 1 compares God's people, the righteous, to a tree. What happened in our game as the "branches" reached out and tagged the other players? (The tree grew bigger.) This is what happens when you tell other people about Jesus' love and forgiveness for them. As they respond to the good things you say and do for them, they'll have the opportunity to trust and follow Jesus. Then God's kingdom will grow bigger and bigger and make the whole world a better place to live! But the best part is, they'll be able to live in Heaven for all eternity too! When you live a righteous life you grow towards God. When you live a wicked life you move away from God. The teacher stands at one end of the playing field. Have the players line up at a start line at the opposite end of the playing area. Before play begins tell the players the teacher represents God. When teacher holds his or her thumbs up (represents righteous living) the players move by walking, running, skipping, etc. towards the teacher. When the teacher holds thumbs down (represents wickedness) the players must freeze. If the teacher sees a player(s) move when thumbs are down, that player(s) must return to the start line. Play continues until a player tags the teacher. The first player to tag the teacher takes the teacher's place in the next round of play. Play as long as time allows.